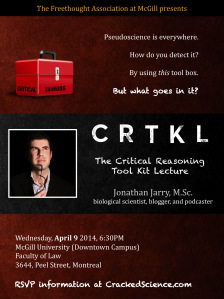 I have been graciously invited by the brand-spankin’-new Freethought Association at McGill to give a talk in the evening of April 9 on critical thinking skills. Why me? I used to head the Montreal chapter of the Centre for Inquiry; I have a background in biochemistry, molecular biology, and human genetics; and as one of the founders of the production collective Moutons No More, I regularly blog on public science topics at CrackedScience.com and host the podcast Within Reason which looks at contentious issues from a rational perspective.